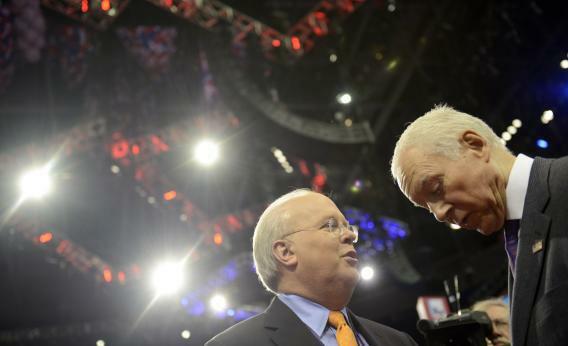 Karl Rove and Senator Orrin Hatch share a word at the Tampa Bay Times Forum in Tampa, Florida, during final preparations for the opening of the Republican National Convention on August 27, 2012. I reported yesterday on the structural challenges facing American Crossroads’ new Conservative Victory Project, the ballyhooed, introduced-on-A1-of-NYT plan to nudge unelectables out of Republican primaries. Since I talked to the Club for Growth’s Chris Chocola, he went on MSNBC to “debate” the man at the helm of the CVP, Stephen Law. When that ended, Law went on the Laura Ingraham show to “debate” Brent Bozell, who runs the Media Research Center and For America, the umpteenth “conservative fightback through petitions” organization. You’re nobody if you’re not condemning the Project, and you’re not really condemning it correctly unless you call it a secret plot by Karl Rove. My inbox is full of examples, fundraising letters from groups that need your money RIGHT NOW to fight Rove. The Tea Party Express! The newly created Karl Rove Super PAC, Conservative Victory Project, is as principled as the RINOs that are funding it. They are looking to target Tea Party candidates that aren’t willing to play along with their beltway politics. We cannot allow them to pick winners and losers by funding elections with money! … To ensure that the Tea Party remains strong and has the resources to oppose groups like this Washington D.C Super PAC, whose goal is to protect ‘business-as-usual’ GOP establishment incumbents against conservative challengers, we need your support TODAY! Imagine a Republican Party without the leadership, energy and principled ideas coming from Senators like Rand Paul, Marco Rubio, Ted Cruz, Pat Toomey and Mike Lee, because that is what you would get from a lack of real primary race competition now being proposed by Karl Rove. The choice is simple: should voters choose who represents them in Washington, DC, or should political insiders make the decision behind closed doors? Ladies and gentlemen, we must not let this stand! We must band together to send a message to Karl Rove that America is worth fighting for; the Constitution is worth standing for; our freedoms are worth every single stance, word, and action that we take to maintain. Unlike Karl Rove, we are not funded by millionaires and billionaires. Our funding comes in the average amount of $43 from every day moms, dads, grandmas, grandpas, and singles who have a common bond….a belief in the United States of America and a desire to fight for her. Please help us fight establishment Republicans like Karl Rove who see you as a threat HERE. The idea of a “GOP civil war” is not just helpful to Democrats. It’s helpful to the conservative groups that would be relevant in these primaries.